Why believe in God? If God exists, why doesn’t he eliminate suffering and evil? Does evolution disprove Christianity? Can religion be explained by cognitive science? People have grappled for ages with these kinds of questions. And many in today’s academic world find Christian belief untenable. 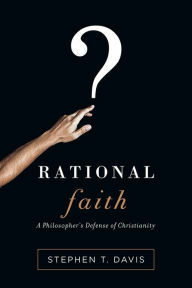 But renowned philosopher Stephen Davis argues that belief in God is indeed a rational and intellectually sound endeavor. Drawing on a lifetime of rigorous reflection and critical thinking, he explores perennial and contemporary challenges to Christian faith. Davis appraises objections fairly and openly, offering thoughtful approaches to common intellectual problems. Real questions warrant reasonable responses. Examine for yourself the rationality of the Christian faith.